Microsoft had never built a pair of headphones before its engineers started on the new Surface headphones three years ago. 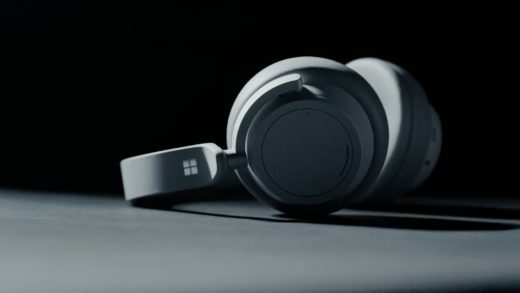 The headphones, which the company unveiled on October 2nd along with other new Surface gear, are a departure from the PC-centric nature of previous Surface-branded products. After using them for a few weeks, I found them to be comfortable to wear and reasonably good-sounding, if not especially good-looking. The audio team that built the headphones got some help from both the Xbox group and the Skype group–teams whose products depend on hours of headset wear by users. Microsoft told me that the Surface headphones were meant for creatives who might need to do long hours of video editing or design work on a Surface Studio desktop computer or one of the Surface hybrids or laptops. They’re wireless, so you can feel free to get up from your desk and walk around, as well as take phone calls. These headphones feel like they’re aimed squarely at the digital-nomad market–people (like me) who spend a lot of time working on laptops in coffee shops or shared workspaces. So I was naturally inclined to compare the Surface headphones with the wireless headset that I and many other digital nomads use: Bose’s QuietComfort 35. Both the Surface and the QuietComfort headphones fit over the ear, which provides some natural passive noise cancellation by physically shutting out sound. Active noise cancellation uses a series of small microphones (on the Surface headphones, two on each side) to constantly analyze the sound of the outside world. Based on that data, the drivers inside the phones emit an equal opposite audio signal to cancel out the sound. 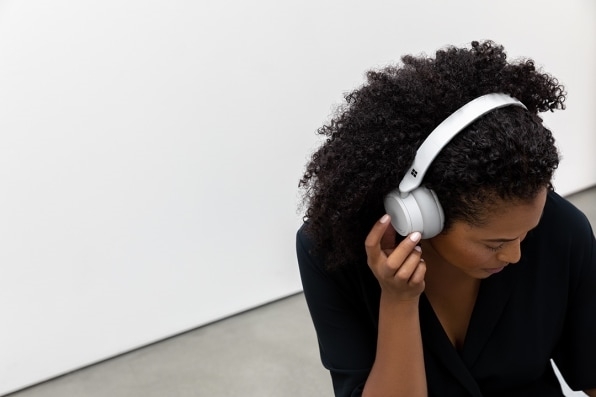 While my Bose headphones offer just one setting of active noise cancellation, the Surface headphones can dial through 13 different noise cancellation levels. The settings range from one that shuts out the maximum amount of sound from outside to one that amplifies the outside ambient sounds inside the phones (you might use that setting if someone suddenly started talking to you). All the settings in between are varying mixes of inside sound and outside sound. That many settings seemed like overkill to me–I used only the cancellation levels at the far ends of the spectrum. With either product’s noise cancellation technology, I can still hear enough ambient coffee shop noise to distract me. Both systems seem to take a scoop out of the low to high-mid frequency ranges, leaving much in the mids and highs easily heard. That’s why I have to listen to white noise while I’m working in public. I give the edge, however, to Microsoft. The Surface headphones at maximum noise cancellation seemed to block out more sound from the outside world than the Bose. But that could be because the Surface headphones grip your head a little more tightly, which might give them a little more passive noise cancellation. 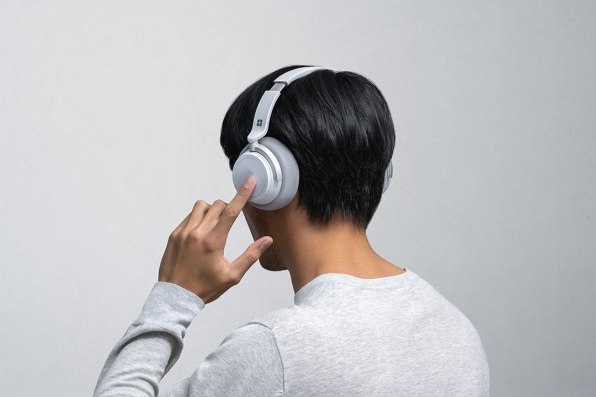 The Bose headphones are somewhat louder than the Surface headphones, although I think the volume produced by the Surface headphones will be enough for most people. Listening to music on the Surface headphones was enjoyable, although I immediately could detect a somewhat “boxy” quality to the sound. Also, I didn’t have quite the volume ceiling that I like. It was only when I compared the two headsets head-to-head that I could hear some shortcomings in the Surface headphones. Wearing the Bose headphones, I felt immersed in the music, while the same music played back through the Surface headphones sounded a bit more remote and contained. Bose created a crisper, punchier reproduction. Vocals had more presence; snare drum hits had more impact. I noticed that the drivers inside the QuietComforts are angled to match the curvature of the outside of the ear. As far as I can tell the Surface headphones’ drivers are not angled. Digital nomads also need to take and make phone calls hands-free, often in noisy environments. I’ve not been happy with the Bose headphones on this score–phone calls are serviceable, but I often hear delay on my own voice, and people on the other end sometimes say they can’t hear me well. My experience making calls on the Surface headphones was slightly better than with Bose. The delay issue, at least, did not seem as pronounced. Call quality problems can’t be attributed only to the headset. It depends on the Bluetooth connection from the headset to the phone, and then on the quality of the cellular connection. I’ve never been a big fan of the Microsoft industrial design group’s taste. But there is an aesthetic; the whole line of Surface products uses a clear and consistent design language. It’s sleek yet muted (or “quiet,” as the designers say), with polished metal and various gray tones. Surface products are anything but flashy. On the contrary, they seem to want to shrink into the background. That describes the look of the Surface headphones too. They’re light gray pretty much everywhere, save the bit of silver showing on the band and the metal yoke pieces that hold each headphone. The phones are perfectly round. They look very different on one’s head than the Bose QuietComfort headphones. My QuietComforts are all black and the earphones themselves are shaped like eggs, which I find pleasing. 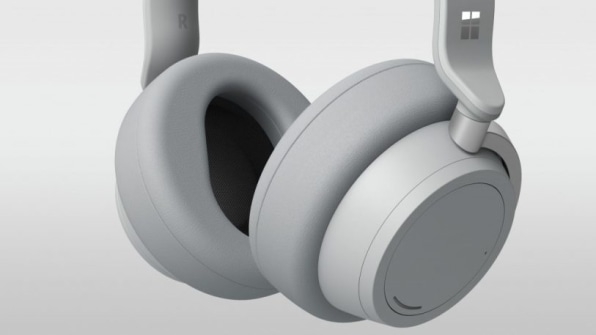 I neither like nor dislike the look of the Surface headphones, and that may be exactly what Microsoft was shooting for. Some of the coolest parts of the Surface headphones are the small things–stuff you might not appreciate until you’ve used the product for a while. They have a large touch control area on the outside surface of each phone (the touch controls are the same on either side). Tap once for play or pause, tap twice to skip a song, tap and hold to activate the Cortana assistant. I found the controls far easier to locate and use than the physical rocker button used for those functions on the Bose. With the head detection feature, the music pauses when you take the headset off, and resumes when you put it back on. When you plug in the USB-C charging cable for just five minutes, the Surface headphones charge up for an hour of playback time. A full charge to 20 hours of use takes two hours. The female voice in the headphones tells you how many hours of use you have left, which I found more useful than the normal “percent of battery” metric you get from your devices. The Surface headphones are slightly heavier than the QuietComforts, but they also seem well balanced so that they sat on my head comfortably. Still, the persistent pressure of the phones themselves on my ears caused some fatigue after a couple hours of wear. I can wear the Bose for three hours and more without feeling much discomfort. Overall, I liked the performance of the Surface headphones. While the noise cancellation has too many settings for my needs, the “full cancellation” setting does work relatively well. If the noise cancellation is the most important feature in your “work headphones,” you might well choose the Surface headphones over the Bose QuietComforts, especially if you use Microsoft’s Cortana. I’ll be sticking with my Bose for the time being, mainly for the sound and the more polished look.